I will be graduating next month from my doctoral program. That means, after May 11th, you can officially call me (Dr), though I will feel weird about it all. I want to pay tribute to my small group in Singapore. Many of them have been supporting me in different ways for the many years since I left for Vancouver. Thus, for the next four weeks, beginning with this article, I will be writing on small group matters. This week, I will be reflecting on small groups as a necessary part of any Church. Growing Churches will have vibrant small groups. Growing groups have people who are convicted by the Holy Spirit about one's sin, counseled by one another, and live in community that shares not just material needs, but spiritual needs. I have read Acts 2 umpteen times, never bored, always amazed. Amazed at how united the members of the early Church are. Amazed at how diligent they meet on a daily basis. Amazed at the same things that they do and yet they do not seem to be bored by the routine. Most of all, I am amazed that the Lord added to their numbers on a daily basis. In a context of a Western Church that seems to be shrinking year after year, this passage of Scripture appears out of this world! The Church in Acts shares everything they have. The modern Church takes when it is possible. The Acts Church comes together daily enthusiastically. The modern Church gathers on a weekly basis, depending on one's work schedule.The Acts Church gave fully of what they have. The modern Church gives a little of what they have. The Acts Church enjoys the favor of all the people. Many in the modern Church expect favor from people. In a nutshell, the modern Church is a far cry from the early Church. I confess I may have been a little harsh on the modern Church. My point is that I am more amazed at how the Church in Acts behave. I am simply giving credit where credit is due. The Acts Church is amazing! It does something that modern Church seminars, inspirational talks, or leadership conferences cannot replicate. Growth. We have seen how the world's largest Church has grown beyond a million members. South Korea's David Cho Yonggi's Church has been growing tremendously. We have also seen the great success stories of Willow Creek Community Church in Chicago, as well as Rick Warren's Saddleback Church. There are also stories of the unofficial church in China, North Korea, and elsewhere in Africa that are growing by leaps and bounds. A sizable amount of growth comes from the prosperity gospel camp. Groups are essential to any Church. It is essential for community building. A healthy Church is not one that has a big building packed every Sunday. A healthy Church is one that has every member in a small group. In other words, a healthy Church is not an efficiently run organization, but a living organism. An organization can strategize, plan, and implement programs to attract people. An organism will be attractive in itself. After all, if a person is cared for, and is able to care for others, everything else is secondary. That includes programs, type of study materials, or the logistics of meeting times and places. If a person has a reason to come, he/she will find every means to make it to the meeting. If the person does not want to come, any excuse is possible. I once interviewed a pastor at a large Church about his Church strategy for growth. "Programs!" he said. His reasoning was that the programs are needed to meet the different needs of the people. Thus, there are programs for different ethnic groups, various age groups, and all kinds of interest groups. The basic conviction is that, with the right program mix, the people will keep coming, and keep bringing friends. I am not too sure if that works. I know of several people from that same church. Apparently, they are not very involved in the Church at all. "Attend Church service only" is the regular answer. The pastors do not know them. They do not know others. Others do not even know they exist. My problem with this approach is that programs may draw people in, but they do not necessarily build relationships. We build relationships with people meeting people where they are, not programs catering to people's tastes. My point is, programs come and go. People live and love. Programs only lead us to the meeting place, but the rest is up to the people. Programs are temporal. People are not. If that is the case, why focus on programs when we ought to focus on people? Now, let me be clear. I am not against programs. I simply want to maintain that programs are only introductions or invitations. The growing and the relating is up to God using us, and us obeying the Spirit's leading. John Wesley has often been credited with the invention of small groups. Douglas Hunt calls Wesley the "pioneer of small-group evangelism." Tim Stafford acknowledges the small group as one of Wesley's "most enduring legacies." It has also been widely recorded that John Wesley's famous "Holy Club" marks one of the earliest versions of Wesleyan style small groups. Here is one tip that Wesley has given the Christian world. 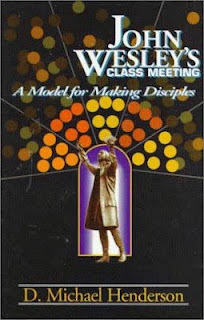 D Michael Henderson has even called John Wesley's Class Meetings as the "Model for Making Disciples." John Wesley writes about the beginning of a small group. Like the Acts Church, I am amazed at John Wesley's strict no-holds-barred purpose of conviction, counsel, and communion. Firstly, there is a conviction to tackle sin head on. Secondly, there is counsel via opportunities to pray and come together to meet on a regular basis. While it is a little different from the Acts Church which meets regularly, Wesley's model follows the rules of consistency (every week) rather than a literal copy of Acts (every day). Thirdly, there is a communion element, whether people's needs are addressed via prayer. Be amazed by the quantity of people being added in the Acts Church. Be amazed by the desire of people to meet to confess sins and grow in Christ during Wesley's times. Can you be amazed by opportunities in your Church to grow small groups? You do not need many. Just begin with two or three persons and launch a small group. Do all the sowing that you can. Do all the watering that you can. Do all the care and cultivation that you can. Then sit back. Pray. Relax, and watch the Holy Spirit makes it grow.